And half of young people who have drunk alcohol were given it by their parents. It comes as ministers urge parents to help their children make sensible decisions about drinking alcohol. The department commissioned research to get a clearer idea of the attitudes and use of alcohol among parents and young people. The study was based on 4,000 interviews with parents, children and young people. It also found that eight out of 10 parents had no pre-planned strategies to tackle irresponsible drinking by their children. One in four of the children interviewed said their parents had never talked to them about alcohol. While the majority of parents said they were fully aware of their child's drinking habits, one in 10 said they were unaware if their child had drunk alcohol. The research is being published as part of a campaign to tackle under-age drinking. Schools Minister Vernon Coaker said: "Today's research shows that parents underestimate their influence over their child's drinking and attitudes to alcohol, yet a quarter of young people have never spoken to their parents about the issue. "That's why through the Why Let Drink Decide? campaign we are giving parents and young people the confidence to have open conversations about alcohol, to ultimately delay the age at which young people start drinking." The chief medical officer for England advises that an alcohol-free childhood is the best option, but if children do drink alcohol they should not do so before the age of 15. And then it should be with the guidance of a parent or carer. Ministers are expected to provide new funds to help police enforce new powers to tackle the issue and to publish a best practice guide for local authorities as part of the campaign. 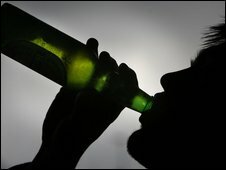 Positive alternatives to drinking alcohol, such as playing football, are also being encouraged as part of the campaign.